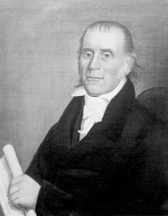 GREGG, Andrew, (grandfather of James Xavier McLanahan), a Representative and a Senator from Pennsylvania; born in Carlisle, Pa., June 10, 1755; attended Rev. John Steels Latin School in Carlisle and the Academy in Newark, Del. ; served in the Delaware militia of the Revolution; tutor in the University of Pennsylvania at Philadelphia 1779-1783; moved to Middletown, Dauphin County, Pa., in 1783 and engaged in mercantile pursuits; moved to Penns Valley (now in Bucks County), Pa., in 1789; engaged in agricultural pursuits; elected to the Second and to the seven succeeding Congresses (March 4, 1791-March 3, 1807); chairman, Committee on Public Lands (Ninth Congress); elected as a Democratic Republican to the United States Senate and served from March 4, 1807, to March 3, 1813; served as President pro tempore of the Senate during the Eleventh Congress; moved to Bellefonte, Pa., in 1814 and engaged in banking; secretary of State of Pennsylvania 1820-1823; unsuccessful candidate for Governor in 1823; died in Bellefonte, Pa., May 20, 1835; interment in Union Cemetery.